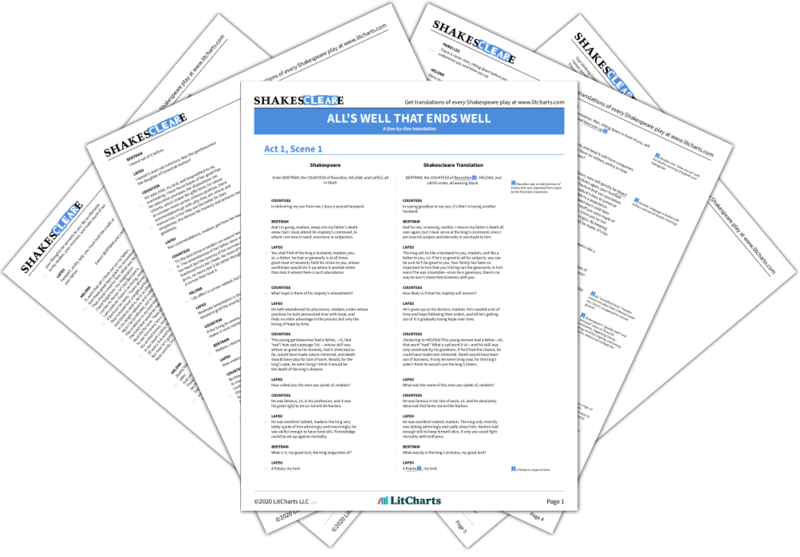 Welcome to the LitCharts study guide on William Shakespeare's All's Well that Ends Well. Created by the original team behind SparkNotes, LitCharts are the world's best literature guides. A concise biography of William Shakespeare plus historical and literary context for All's Well that Ends Well. A quick-reference summary: All's Well that Ends Well on a single page. In-depth summary and analysis of every scene of All's Well that Ends Well. Visual theme-tracking, too. 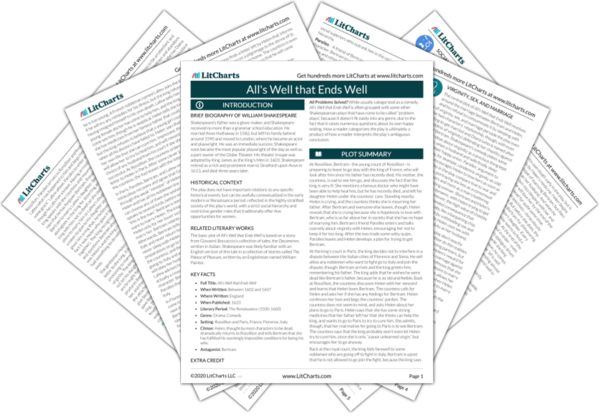 Explanations, analysis, and visualizations of All's Well that Ends Well's themes. All's Well that Ends Well's important quotes, sortable by theme, character, or scene. Description, analysis, and timelines for All's Well that Ends Well's characters. Explanations of All's Well that Ends Well's symbols, and tracking of where they appear. An interactive data visualization of All's Well that Ends Well's plot and themes. The play does not have important relations to any specific historical events, but can be usefully contextualized in the early modern or Renaissance period, reflected in the highly stratified society of the play’s world, with a strict social hierarchy and restrictive gender roles that traditionally offer few opportunities for women. The basic plot of All’s Well that Ends Well is based on a story from Giovanni Boccaccio’s collection of tales, the Decameron, written in Italian. Shakespeare was likely familiar with an English version of this tale in a collection of stories called The Palace of Pleasure, written by an Englishman named William Painter. Climax: Helen, thought by most characters to be dead, dramatically returns to Rossillion and tells Bertram that she has fulfilled his seemingly impossible conditions for being his wife. All Problems Solved? While usually categorized as a comedy, All’s Well that Ends Well is often grouped with some other Shakespearean plays that have come to be called “problem plays,” because it doesn’t fit easily into any genre, due to the fact that it raises numerous questions about its own happy ending. How a reader categorizes the play is ultimately a product of how a reader interprets the play’s ambiguous conclusion. Fredericksen, Erik. "All's Well that Ends Well." LitCharts. LitCharts LLC, 19 May 2014. Web. 20 Apr 2019. Fredericksen, Erik. "All's Well that Ends Well." LitCharts LLC, May 19, 2014. Retrieved April 20, 2019. https://www.litcharts.com/lit/all-s-well-that-ends-well.